Today we’re talking about we cases of time traveling, from a time traveler who passes a lie-detector test to a man from the future who earned a fortune on the stock market. Join us as we take a look at ten real cases of time travel that can’t be explained. In February 2018 a man who claimed to be a time traveler underwent a lie detector test on camera. The man. only known as Noah, said he was from the year 2030 and made several predictions for the near future. Among them he said that Donald Trump would be re-elected for a second term of presidency in 2020, time travel will be invented and the first humans will visit Mars. He also claimed that Bitcoin will be used as a currency but that cash money will still exist. Noah also claims to have some sort of futuristic technology implanted in his wrist that is somehow involved in the time-travel process. An x-ray confirms that there is in fact some sort of device embedded under the skin but he refuses to have it surgically removed. Several days after the lie-detector test Noah was reported to have mysteriously vanished. During the livestream it was then revealed that he contacted the channel via email stating that he was briefly taken back to the year 2030 for interrogation but is now back in our time. The bombing of Hamburg, 11 years before it really happened. In 1932 journalist J Bernard Hutton along with photographer Yocum brand was sent to do a story on the Hamburg shipyard for a German newspaper, The pair claimed that shortly after they arrived at the shipyard bombs started raining down from the sky and they had to scramble to safety. When they emerged they took several photographs of the devastation before returning to Hamburg. When the pair told their story no one believed them as there had not been a bombing of any sort. Determined to prove that they were not crazy, they developed the photographs they had taken, but to their shock, the photographs showed no signs of an air raid whatsoever. Eleven years later Hutton was living in London when he opened a newspaper and read that an air raid had taken place on the Hamburg shipping yard. The bombing was part of the Allied attack codenamed Operation Gomorrah. To his amazement the photographs in the newspaper looked just like the ones he thought he and Brandt had taken years earlier! Did the pair slip through some sort of time rip and had they actually witnessed an event that was yet to occur? Mobile phones in use, long before they were invented? in 2016 a mysterious photograph surfaced on Icelandic social media. It showed downtown Reykjavik in 1943 at the height of World War II in the foreground a group of American GIs can be seen standing outside a taxi station, as well as a man leaning against a window who appears to be talking on a mobile phone long before they even existed. Originally posted to a Facebook group by Kristian Hofmann, it quickly began to attract attention across the Internet. The photo was so convincing that many people said it was irrefutable proof that time travel must exist while others thought that it showed that the mobile phone must have already been invented and was in use in Iceland by the 1940s. What do you think? Is this man from the 1940s really using a cell phone? There have been several recorded instances of people seemingly using technology that shouldn’t exist at the time. Many believed it to be evidence of time travel. This footage of a woman exiting a DuPont Factory was taken in 1928 and if you look closely it appears that she’s talking on a mobile phone. This footage was taken from the opening of a Charlie Chaplin film in 1928 and as the camera pans in a lady can be seen walking past chatting on another mobile phone. What do you think? 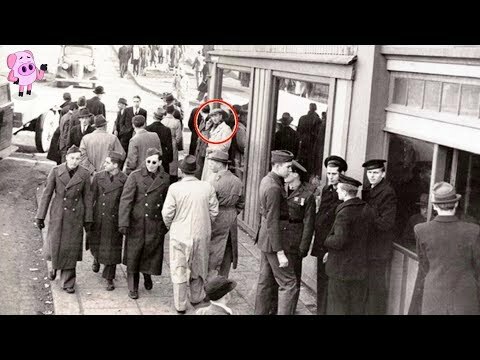 Does this footage really prove that time travel exists? This now famous black-and-white photo was taken on the day Southfork bridge reopened in Canada in the early 1940s. Take a look at the man in the middle right of this image. He’s wearing a pair of modern sunglasses and a logo printed t-shirt. If this is a real time traveler, why has he traveled to the 1940s to witness a bridge reopening in Canada? Now I know some of you are thinking that you’ve seen this photo a million times before the way to the number one spot where we’ll reveal an extra piece of shocking information. Cell phone at the 1962 World Cup Final? This photo was taken after Brazil’s triumph over Czechoslovakia in the final of the 1962 FIFA World Cup. The man holding the trophy is Brazilian player Garrincha who was voted player of the tournament. If you look directly below him there’s a man who appears to be taking a photo of Garrincha using a mobile phone. Could this be evidence of a time traveler who’s traveled back in time to witness this historical sporting occasion? Time Travel at the Palace of Versailles? in 1901 two professors from a College in Oxford England travelled to France to visit the Palace of Versailles. As they were walking around a small chateau within the grounds known as Petit Trianon the pair claimed that something very strange happened. They said they were suddenly surrounded by people dressed in 1780s period attire and that Mary Antoinette herself was sitting on a stool in the gardens. Seemingly impossible as Antoinette, the last queen of france was found guilty of high treason and beheaded by guillotine in 1793! The pair then claimed that everyone mysteriously disappeared just as a tour guide approached them. In 1911 the two professors wrote a book under the aliases of Elizabeth Morrison and Frances Lamont that described in detail their bizarre experience. Because of the credibility of the authors and the grounded accounts of which they told their story it is widely regarded as one of the best pieces of evidence that Timeslips may actually exist. Did they experience a time slip or was it some sort of strange hallucination? In 2008 archaeologists opened a sealed tomb in China that supposedly hadn’t been disturbed for more than 400 years. Inside the coffin they discovered a small wristwatch with the time frozen at 10.06. On the back the word Swiss was engraved. The first wristwatch, however, was not made until the 1800s which makes the discovery so baffling. Was the watch left behind by a clumsy time-traveler, or could it just be an elaborate hoax? In a video published in February 2018 a man by the name of Alexander Smith claims to be a time traveler that’s visited the Year 2118 In the video he says that he’s actually one of the first people to ever use time travel technology as part of a top-secret CIA mission in 1981. He goes on to say that a group of unnamed people were looking for him and that he was living in hiding, Among other things Smith claims that by the mid 21st century it’s become widely known to the public that intelligent alien life exists. He goes on to say that they’ve been visiting earth for a long time and that the government has been keeping it a secret he also says that while walking around in the year 2118 he came across a statue of a man named Jaynou Oliver Beck who he later found out would become President of the United States and be assassinated, and that beck was to be born in September 2018. At the end of the interview Smith reaches into his jacket and produces a photo of a city he claims he took while visiting the year he then mentions that the reason the image is slightly distorted is due to the time travel process. in 2003 a newspaper reported that a man by the name of Andrew Carlson had been arrested on insider trading charges. According to a report by the Security and Exchange Commission Carlson had turned an initial investment of just 800 dollars into a portfolio worth around $350 million while trading the stock market. All the trades he made were high-risk and based on information that he couldn’t have known unless he had inside information. Carlson was interrogated by the FBI and confessed that he was actually a time traveler. He claimed that his plan was to make several small trades here and there that would go unnoticed but that he got caught up in the excitement of the situation and ended up making a fortune. The more the FBI pressed him the more Carlson insisted that he was actually from the future. In an effort to prove his story Carlson is said to have even told the FBI where Osama bin Laden was hiding as well as giving them the cure for AIDS. However the story gets even stranger! In an effort to further prove himself Carson offered a photo as proof that he was actually a time traveler. He claimed that he was also witness to the reopening of the Southfork bridge in Canada in the early 1940s alongside the mysterious man dressed in modern-day clothes! Carlson pleaded with the authorities to release him so he could return to his own time. However he refused to give up the location of his time craft for fear of the technology falling into the wrong hands. Shortly after his arrest a mysterious man posted his bail of 1 million US dollars. He was due to appear in court in April of 2003 but disappeared on the way to the hearing. There was no record of an Andrew Carlsson existing prior to December 2002 and he was never seen or heard from ever again.